Posted on October 12, 2015 by nathanlostlighthouse	in Uncategorized, Video Games and tagged gaming, Ground Zeroes, Hideo Kojima, Konami, Metal Gear Solid, Metal Gear Solid V, PS4, Quiet, Sci-Fi, stealth, The Lost Lighthouse, The Phantom Pain, TLL, tllgaming, video game reviews, video games, Xbox One. Firstly I must apologise for not submitting a review for the latest Batman: Arkham Knight. I have been very busy with work and studying so had no time to write a full review but in short it is brilliant, go and buy it and play it to your hearts content. However after playing it I found an empty void, I tried a few different games to fill it, such as the new Witcher game however, I just didn’t get into it, I found The Evil Within boring so I got stuck playing Call of Duty: Ghosts for a while. I noticed the latest Metal Gear Solid installment and thought I would give it a go. I am a fan of the series, however I find the games a bit hit and miss. The first Metal Gear Solid on Playstation was fantastic, and the same could be said for Sons of Liberty and Snake Eater. However, Guns of the Patriots I found very boring, it was more an interactive movie than a game, but I carried on nonetheless. I didn’t play Ground Zeroes but I was told it wasn’t completely essential, instead I went in head first to the Phantom Pain. Please note, there are spoiler alerts ahead. It can be said that is a little different from the other games, however I had heard that Ground Zeroes was similar. It is not a linear, one way stealth game, it is an open sandbox style game with 2 maps. Don’t get me wrong, you still have to use stealth to infiltrate camps and take out enemies, but you can use your surroundings to your advantage. You get the tranquilizer gun to take out your enemies instead of killing them (which gets you points and points mean prizes) and an arsenal of sniper rifles, assault rifles, rocket launchers etc at your disposal. You also develop your base for your army and send out your squad mates on missions. But how do you hire your army? Well you don’t. You kidnap them and basically hope they join or put them in jail until they join. And how do you kidnap them? 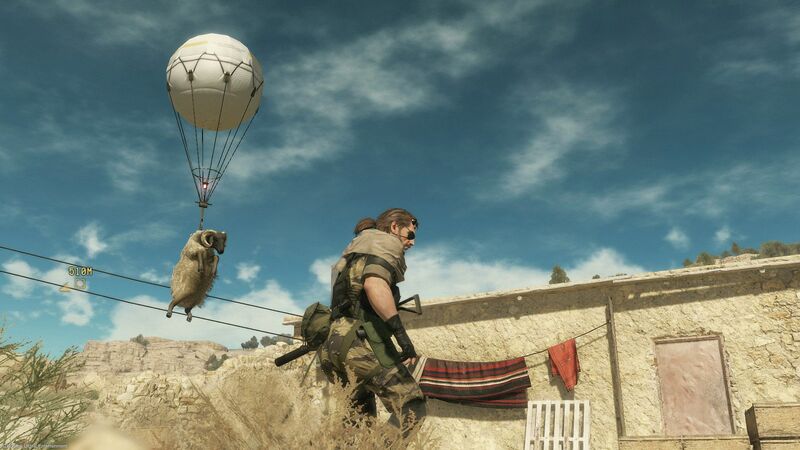 By using a giant balloon that flies stunned or asleep enemies into the air, which by the way is hilarious. The gameplay is brilliant, you do have to use lots of buttons to shoot like the old games but this didn’t bother me at all. You can also restrain enemy soldiers and interrogate them and then choose to kill them or not. I mostly suffocate them and then kidnap them. Each soldier is usually ranked from S++ to E on skills in Intel, Support, Combat, Research, Medical and Base Development. Upon leveling up each area, you can develop new weapons and vehicles. The storyline is excellent, it is mainly developing the base by carrying out missions and side missions. Side missions usually include extracting highly skilled soldiers, recovering blueprints and saving prisoners. The main missions are a lot more difficult and for some reason Mr Hideo Kojima decided to put credits before and after each mission. This is fine, however the credits show you who you can expect to meet during the mission which gives the game away. It’s slightly annoying as you now know what to expect in each mission. There is something I do love about the missions however. You can be sneaking through an enemy encampment and reaching a group of people to extract when suddenly, Hideo Kojima throws a curve-ball of Japanese lunacy to your prim and proper stealth game. 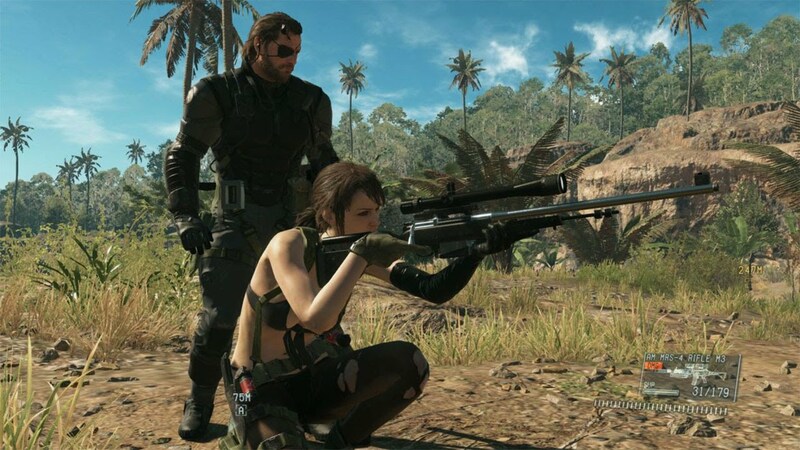 I won’t spoil it for you, but there are many weird and wonderful characters throughout the game that you need to look out for, however the one you most definitely will have seen is Quiet, the scantily clad sniper. You have an epic fire fight with her and then after much deliberation, she becomes your ally. She is very useful but she doesn’t always follow you. She’s not useful for stealth missions however, as at the beginning she only has a rifle that kills and as I said before, not killing people means prizes. You can equip her with a tranquilizer rifle if needs be, hopefully that will make stealth missions a lot easier. Another aspect of the game I thoroughly enjoy is the Easter Eggs within the game. There are diamonds and resources to collect as well as posters, but the best item to collect is the cassette’s of 80’s music. They are dotted about each map and when discovered, they are added automatically to your playlist. And of course you can play them as you are playing the game, it makes the stealth harder but a lot more fun. I won’t lie, listening to Europe’s The Final Countdown whilst waiting to blow up some tanks is hilarious, but there are other classics available such as David Bowie’s Man Who Sold the World and Joy Division’s Love Will Tear Us Apart. All in all it is a truly brilliant game, lots of action and adventure and a gripping storyline full of twists and turns along the way. I would give it 10 hilarious sheep extractions out of 10. Probably one of the best Metal Gear Solid games ever made and certainly one of the best games I have played this year. Fallout 4 isn’t too far away and I’m sure it will be epic, but it’s going to have to be spectacular to knock this game down. Posted on September 25, 2015 by thelostlighthouse	in Podcast and tagged AAA games, Batman, Batman Vs Superman, Bill Finger, Bob Kane, comics, DC, DC comics, Doctor Who Jenna Coleman, gaming, Gotham, Jason Statham, Konami, Marvel, MCU, Metal Gear Solid, Metal Gear Solid V, MGSV, Paul Bettany, Sci-Fi, The Lost Lighthouse, The Phantom Pain, TLL, tllpodcast, Vision, Weekly Rapture, Zack Snyder.. This week we chat about DC finally crediting Bill Finger on their TV and film projects, Paul Bettany’s excellent response to Jason Statham’s barbs at the MCU and the weird rumours about Konami halting AAA development (apart from PES) following the extremely well received MGSV: The Phantom Pain, while Gary paints everything and Adam keeps throwing out opinions that do not necessarily represent the opinions of The Lost Lighthouse. No main talking point or Gary in 60 seconds this week, we were both pretty busy and Gary forgot to pick a film for Adam. Posted on April 10, 2015 by thelostlighthouse	in Podcast and tagged Arrested Development, comics, David Lynch, Deadpool, Deus Ex, Deus Ex Humanity Divided, films, gaming, Halo 5, Hideo Kojima, Hunt the Truth, Konami, Mad Max, Mad Max Fury Road, Metal Gear Solid, Microsoft, Ryan Reynolds, Sci-Fi, The Lost Lighthouse, The Phantom Pain, theweeklyrapture, TLL, Twin Peaks, Weekly Rapture, Xbox One. Welcome back to The Weekly Rapture, brought to you by The Lost Lighthouse. This week we chat about Deadpool’s costume and possible R-rating (spoiler warning for the latest issue of the comic too, but you’ve probably already heard what happens), the new Mad Max: Fury Road trailer, the Halo 5 Hunt the Truth teaser site, whatever is happening with David Lynch and Twin Peaks or Hideo Kojima and Konami, and the Deus Ex: Humanity Divided trailer, while Gary tries to pull himself away from the icy clutches of death, and Adam waits patiently for Ryan Reynolds to return his affections. No argument, 60 seconds or main talking point this week, largely because of illness and being too busy to actually adhere to any of our features. Next time! If you have any thoughts. questions or opinions on anything this week you can as always get in touch through Facebook or on Twitter @lost_lighthouse, email us at thelostlighthouse@live.co.uk or sound off in the ‘leave a reply’ box at the bottom of the podcast page on the website. Posted on March 6, 2015 by thelostlighthouse	in Podcast and tagged Adi Shankar, Age of Ultron, Arkham Knight, Avengers, Blade Runner 2, comics, DC, DC comics, films, gaming, Harrison Ford, Image, Image comics, James Gunn, Kelly Sue DeConnick, Marvel, Matt Fraction, Metal Gear Solid, Power Rangers, Power/Rangers, PS4, Sci-Fi, Sony, superhero films, The Lost Lighthouse, The Order 1886, The Phantom Pain, The Walking Dead, theweeklyrapture, TLL, tllpodcast, video games, Weekly Rapture. This week we chat about video game length, Blade Runner 2, Arkham Knight’s mature rating (and new trailer) and Power/Rangers while Gary takes a trip in the wicker man and the police sound like they are closing in on Adam in his new flat already. The main talking point was whether we have hit a saturation point with all the superhero films and comic book adaptations out and coming out, following on from some snubs and complaints about superhero films at the recent Oscars ceremony, and James Gunn’s response to it. We get some of your opinions, and discuss our thoughts on it.